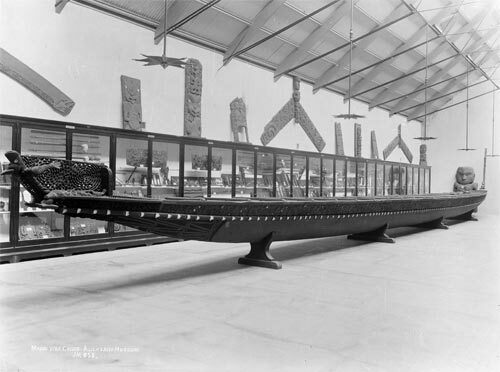 Te Toki-a-Tāpiri is one of the last of the traditional waka taua (war canoes) remaining from the 1800s. It is 25 metres long and carried up to 100 people. It was built around 1836 for Te Waaka Tarakau of the Ngāti Kahungunu tribe. Before it was completed it was presented to Te Waaka Perohuka of Rongowhakaata who, along with others from his tribe, carved the prow, the sternpost, and the thwarts. From here it passed through the guardianship of the Ngāpuhi people, then Ngāti Te Ata and Ngāti Whātua, until it ended up in the hands of the government. It is now on display in the Auckland War Memorial Museum.